UGH. Ever get in a rut in the kitchen? When you feel like you only cook the same 4 dishes (or variations thereof) over and over, and yes, you’re getting good enough too cook them in your sleep, but why on why can’t you come up with anything NEW? There were a few weeks there when we first moved in, that I made a crustless quiche and lasagna each week. This tofu stir-fry did the trick. Note: when making it, I followed the recipe and did NOT fry the tofu before adding it to the vegetables. Bad move–it added probably 20 minutes to the cooking time. I have learned the hard way with tofu – it needs time and space to crisp properly and get that delightful golden-brown color. Else you’ll end up with poached tofu (not bad if that’s what you are going for). Fitness Magazine calls this Buddha Tofu, but let’s just call it a Tofu Veggie Stir Fry, shall we? Tofu is a tricky beast. The first time I had it, in my pre-veg days, it was served raw, sitting on a bed of vegetables. It looked and felt like a slimy wet hand that you have to shake, and tasted like… well, nothing. For a long time I thought that I actually hated tofu, and didn’t really give it a chance. Now, I am a little more experienced with it, but still find oftentimes that many recipes call for a deep frying, or baking. 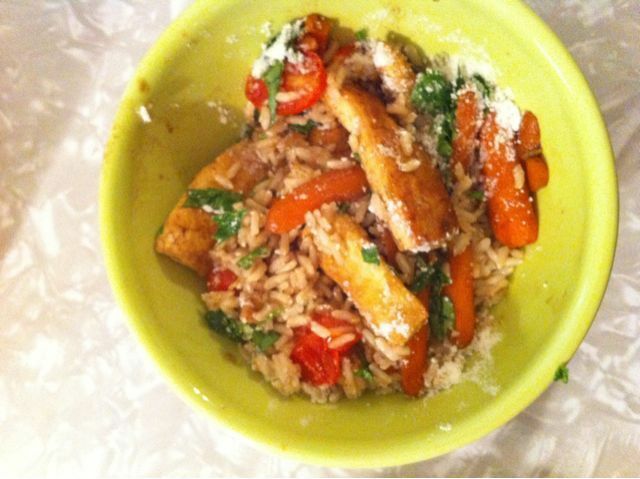 My favorite tofu dish (below!) embraces the texture of tofu without having to fry it in lots of oil.